The 3D projectors category includes the latest projectors used for 3D 1080p home theater systems, and digital 3D movies. If ever there was a great story for projectors, that has to that 3D projectors may well finally catapult home theater and home entertainment projectors into the lime light, and start stealing serious market share from LCDTVs. 3D on a 42" LCDTV is cool, but hardly as impressive as a theater. 3D projectors filling screens typically from 92" diagonal to 130" diagonal, is a game changer. Like in a theater, you are immersed in 3D, not looking at some small 3D box. 3D projectors are now being used for home theater, for 3D gaming, in education, and for specialty business and scientific applications. 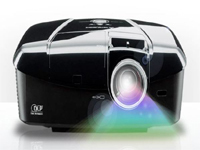 The new 3D projectors that launced in 2010, including many education and business 3D capable projectors were lower res under $1000, while 1080p for the home started from $4500. Affordable 1080p 3D projectors were a no show til CEDIA - fall of 2011. CEDIA offers new 3D projectors like Panasonic PT-AE7000U, the rumored Epson 3D projector, three Optoma's, plus more. That will fill shelfs with affordable 3D projectors, most boasting very good quality and more brightness than before.